Emerson Electric Company (EMR) is a diversified global manufacturing and technology company. It offers wide range of products and services in the areas of process management, climate technologies, network power, storage solutions, professional tools, appliance solutions, motor technologies, and industrial automation. It is recognized for engineering capabilities and management excellence, Emerson has more than 140,000 employees and approximately 255 manufacturing locations worldwide. EMR is a Dividend Aristocrat and member of Broad Dividend Achiever and has been raising dividends for last 53 years. The most recent dividend increase was in November 2009. I have a long position in EMR. My objective here is (1) analyze if EMR still continues to be a good dividend growth stock; (2) how does it rate on my scale of risk-to-dividends; and (3) whether can I continue to add to my existing positions. 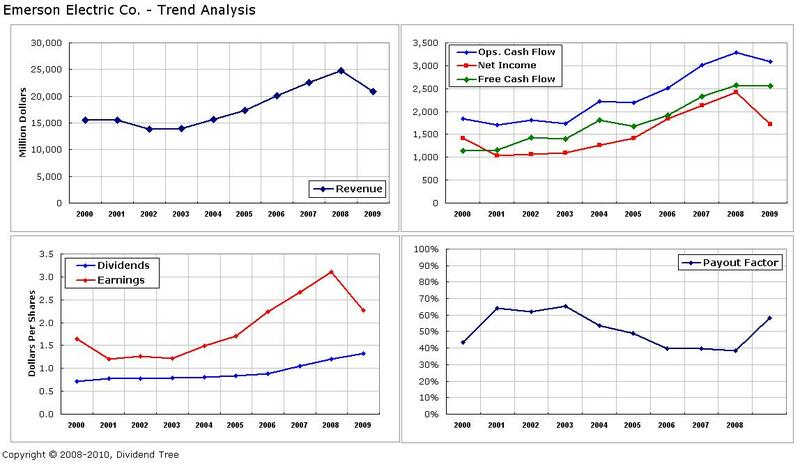 Here I am looking at trends for past 10 years of corporation’s revenue and profitability. These parameters should show consistently growth trends. The trend charts and data summary are shown in images below. Revenue: In general, a growing trend since 2002. The average revenue growth for last 10 years has been approximately 6.6%. Year 2009 had dip in revenue. EPS from continuing operation: In general, it had an increasing trend from 2003 onwards. It had a dip in 2009. Year 2010 is likely to be increase. Here I use the corporation’s financial health to assign a risk number for measuring risk-to-dividends. The risk number for risk-to-dividends is 1.86. This is a medium risk category (albeit very close to being a low risk) as per my 3-point risk scale. The drop in revenue, drop in operating margin, and increase in payout factor makes this as medium risk. Since FCF continues to be good and all earlier payouts were low, this is likely to be low risk in 2010 and beyond. This section measures the dividend growth rate, duration of growth, consistency over a period of past ten years. Dividend growth rate: The average dividend growth of 7.1% is little less than average EPS growth rate of 9.3%. Dividends are more or less growing along with the earnings. Duration of dividend growth: 53 years. Payout factor: It is 58% due to drop in EPS. There seems to be sufficient room to sustain and/or grow dividends. The range of fair value is calculated as $28 to $37. Emerson Electric Co. was founded in 1890, based out of Missouri, and has been paying and growing dividends since last 52 years. What surprised me was EMR’s evolution, its ability to sustain margins and grow, and worldwide reach. Its revenue is pretty diversified in eight product sectors and four global regions. Approximately 23% of its revenue comes from Asia and Latin America. It continues to have stable gross and operating margins. It generates relatively consistent operating and free cash flows. 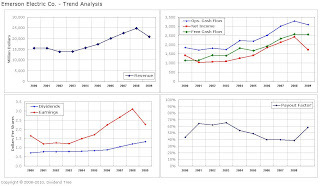 2009 FCF was higher than last year, primarily due to cost reduction efforts. After drop in 2009 earnings seems be slowly recovering in 2010. I believe its strong balance sheet will allow it to continue to wither the slow down and enable its expansion in other geographical markets. I like EMR’s diversified revenue stream and geographical presence. Overall, it is a US based company that will provide hedge against dollar fluctuation and proxy for foreign developed/emerging markets. It has been raising dividends for last 53 years. EMR’s end-markets are cyclic and it appears that it knows how to wither such business environments. It has a strong balance sheet and competitive market positioning. The stock’s current risk-to-dividend rating is 1.86 (medium risk). The current pricing of $46 is at 27% premium to the high price I am willing to pay for EMR. I would be open to add to my existing position when EMR is near my buy range. Full Disclosure: Long on EMR.